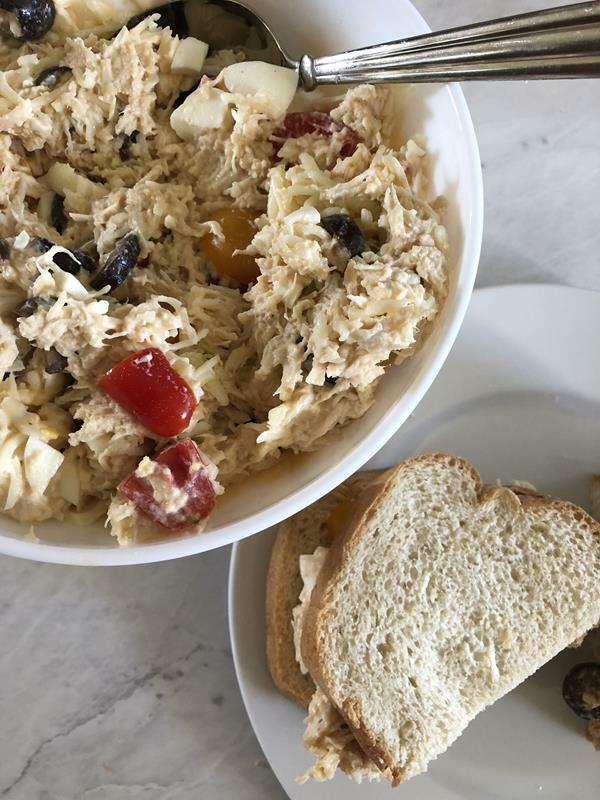 Chicken salad has become one of my favorite quick and easy meals. It is easy to make and everyone in my family loves it. One of the things that I love about chicken salad is that it can be served in different ways. It can be served on bread or on rolls for a chicken salad sandwich. It can also be served on piece of lettuce for a lettuce wrap or with lettuce on a tortilla. It can even be eaten with crackers or simply as is with nothing else. It is one of those meals that is great to serve because everyone can eat it how they want it. 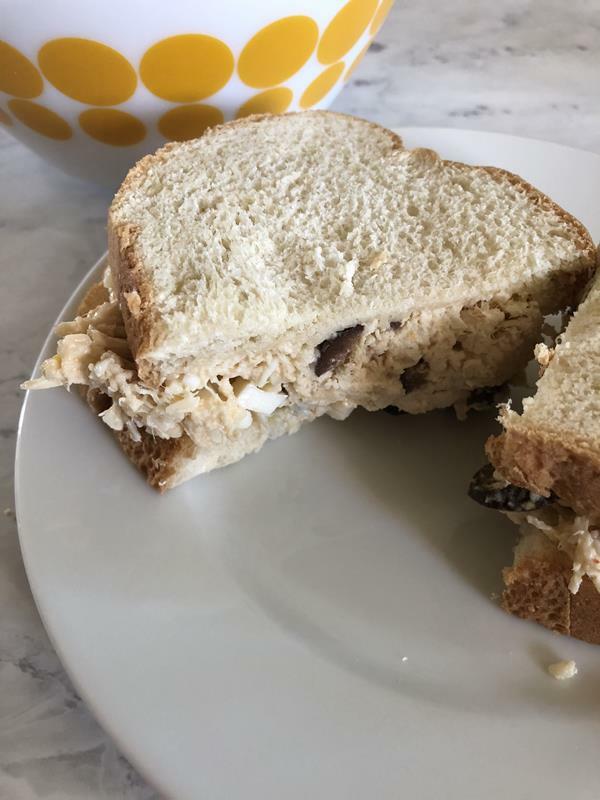 A few weeks ago I shared my version for a basic chicken salad sandwich. That version will probably always be my favorite. It is simple and classic. No extra add ins. Just a basic chicken salad. Over the summer though I started to branch out when it comes to chicken salad. I spent a good portion of the summer sick with diverticulitis. I am feeling pretty much back to normal, but for quite a few weeks I was limited to what I could eat. Once I started eating again I had to eat simple more light food. Anything really greasy, heavy, or hard to digest bothered me. In other words I ate a lot of eggs, chicken, turkey, bananas, avocados, and other basic foods. Because I was eating a lot of chicken and turkey I figured out ways that I could change it up. Chicken salad was one of the things I changed up with several different versions. Over the next couple of weeks I have several different chicken salad type of recipes that I will be sharing with you. We are starting with this Italian Chicken Salad. I love this chicken salad. My husband and son love it on bread, but my favorite way to eat it is on a gluten free tortilla. 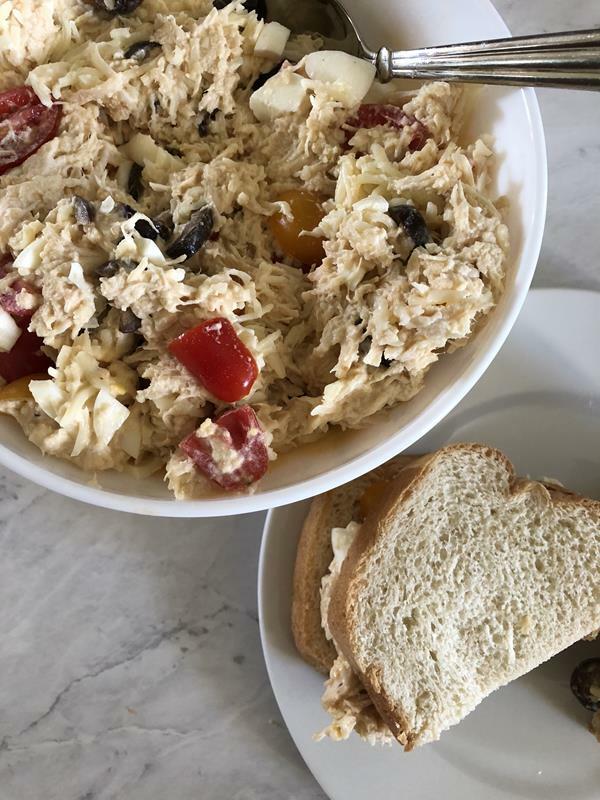 For this recipe I took the basic chicken salad combination of chicken and mayonnaise and added in tomatoes, mozzarella cheese, olives, and Italian dressing. This combination keeps it simple with everyday ingredients, but gives it a little different flavor than a regular chicken salad. My family loves this. You can easily change this up by using more or less of the add in ingredients. It is one of those recipes that is easy to vary depending on what you have on hand. Italian Chicken Salad is a quick and easy dinner that can be served on bread, on lettuce, or in a wrap. 1/2 - 3/4 cup Italian salad dressing The amount will vary depending on how wet/dry you want your chicken salad. Start with 1/2 cup add more for desired texture. In a bowl combine chicken, eggs, cheese, tomatoes, and olives. Set aside. In another bowl combine Italian salad dressing, mayonnaise, and salt. Stir dressing mixture into chicken mixture. Mixing just until well combined. Serve on bread, lettuce, or as wraps.